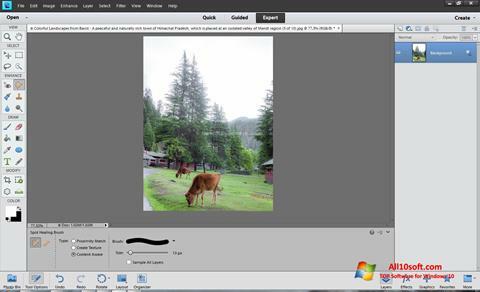 Photoshop Elements for Windows 10 - A tool for fine-tuning the graphic parameters of photographs. The application is able to handle a set of photos using a single style to ensure a given level of contrast, brightness and color temperature, contains tools for retouching, deleting and blurring extra details. The program uses separate layers for each operation, can restore colors on old photos, supports automatic uploading to facebook. Includes a module for creating collages and panoramic images, allows you to generate your own effects and gif videos with a transparent background. You can free download Photoshop Elements official latest version for Windows 10 in English.